By Harry Grover Tuttle, Ed. D.
– Tells me my actual speaking skill, not my grade with homework,etc. Do world language students use technology n the classroom? Do their teachers go beyond having their students use technology simply for the drill and practice in vocabulary and grammar? Students can use laptops and mobile devices to hear authentic language, read authentic texts, read tweets about famous performers, see up-to-the-moment culture, watch video clips, see tv shows, and communicate with native speakers (Tuttle, 2013). Teachers can help students select those learning activities appropriate to their language level. Often these mobile activities have built in context to help the students understand the language. For example, an online newspaper headline often has a picture to help convey the meaning. Students know how do use these mobile technologies for communication; their teachers just need to redirect their communication to being in the target language. Students enjoy looking at pictures and they can look at up-to-moment pictures of things happening in the target language area. Many students spend time watching videos on their own but now the world language teacher can have them watch video clips about a familiar situation. How do your students use their mobile device in your world language class? Does technology take your students out into the target language world? Having been both a technology integration teacher and a district technology administrator, I realize that teachers accept and implement a technology when they feel that the technology will help their students to learn and it is easy to implement. Often times, teachers have no idea of how to to use the technology in their classrooms. Frequently, professional development gives general examples such as those from the technology company but it does not provide examples specific to a subject area. As I thought of how to help more teachers integrate mobile learning into their classes and, particularly, their modern language classroom, I decided to create a book which shows a wide variety of mobile learning activities. I focused on a book to improve to students’ modern language communication and culture awareness through mobile learning tools and apps. I developed in-class and out-of-class learning in fourteen different categories of mobile learning (mobile pictures, internet search, internet image search, timer, poll and survey, QR code, voice and video recording, phone, video chat, media, apps, texting, twitter, Facebook, Wikis and Websites). Over 70% of these interactive mobile activities help develop students’ speaking skill; other language activities include listening, reading, writing and assessment. The students participate in authentic culture through these mobile activities. I developed mobile activities that are easy to integrate. 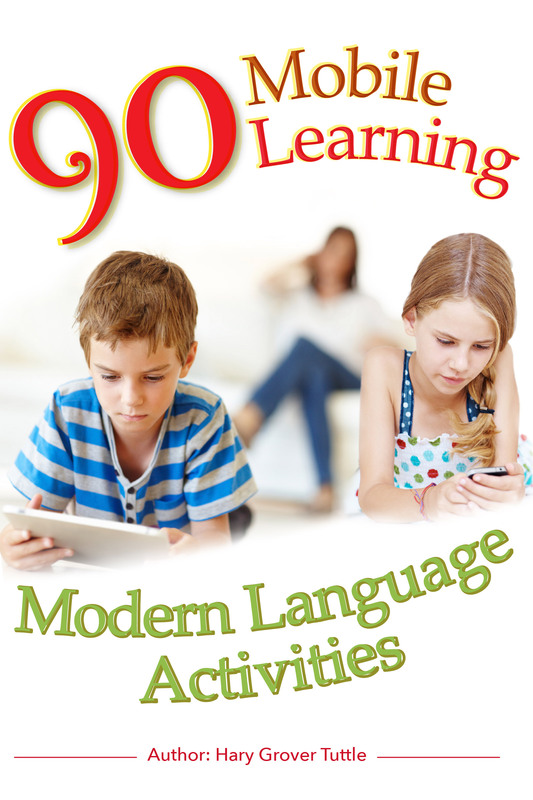 Please share this ebook link (http://bit.ly/90mlact) with your modern language teachers, modern language chair, professional development person, and technology integration person to help them see the many ways to use mobile learning in modern languages. Although modern language teachers may be using mobile learning, they may not be aware of the various categories of mobile learning apps or of tools. The following list gives teachers new resources to use in their classroom. Teachers can use some mobile apps to help flip the language classroom since students can pre-study the vocabulary or pre-study a verb video. Likewise, the foreign language teacher can have students use specific apps if they display a learning gap on a formative assessment. Even more important, the teacher can have the students listen to native speakers, read target language newspapers, and see up-to-the-minute culture in the country. To find a particular app, the teacher searches with terms such as “Spanish radio app ipad” or “French verb forms android app”. Many apps and tools are free or have introductory lessons. So what apps do you use? ACTFL has a 90% guideline to indicate how much teachers should speak in the modern language in the classroom. However, I think that ACTFL should concentrate less on the teachers and more on the students. Basically, the question for a language classroom is “Who needs more language practice the teacher or the students?” if the students need more practice, then they should be the ones talking the most in the class, not the teacher. – Students’ modern language talking should be 70% of the total talk in each class. – During each class students should talk at least once with at least five consecutive sentences. – In each class, students should have at least one interactive spontaneous speaking conversation with another student of three minutes. – Each student should say at least 30 sentences in the modern language each class. I do not believe that students simply saying grammar drills or doing vocabulary drills, no matter how fancy these drills are, constitutes real language use. I would not count those sentences as speaking the language. I would like students to move from practicing the language to using the language even at the beginning levels. I would them to communicate. From now on, I will only post my modern language/ foreign language/ world language posts to my Improving Modern Language Learning at modernlanguagest.wordpress.com Within the next few weeks, I will move all old languages posts to there. No, there are no common core standards for Modern Languages. Yes, Modern Language teachers are looking at the English Language Arts Common Core. No, those teachers should not panic. I have been in education for over 40 years. I have seen many many movements and new approaches. I have been in education long enough to see the same movement resurface with a new name. With each new building principal came a new way of doing things, with each new superintendent came the newest approach, and with each new leader of state education or professional organization came a new vision. Usually the new approach, especially the common core in Modern Language, does not require multiple days of professional development even a half day; most times modern language teachers can make the change within about an hour. 1. What am I presently doing that directly fits in that approach? 2. What am I doing that I can modify slightly to fit the approach? Sometimes it is as simple as a name change or where something goes in a lesson. For example, what is the new name for an anticipatory set? I believe that Common Core English just uses different labels than we do in Modern Languages when we use the labels from ACTFL or state guidelines. 3. What do I have to change completely or add to what I already do? I am waiting for someone to develop the magic cheat sheet that converts the English Language Arts Common Core to Modern Language learning. We already do them, we just have to give our activities a new name or number. I have attended two workshops on Common Core and Modern Languages and neither kept it simple. In fact, I walked out more confused than when I went in. A Modern Language department could do a CC to ML conversion chart in about a fifty minute meeting. If you know of anyone who has developed the magic conversion chart, please let me know so I can share it with other Modern Language teachers. Are Modern Language Students’ Real Questions Found in their Textbook? What are you like? / Are you (athletic, …..)? Where do you live? /How long have you lived here? What school/college do you go to? What is your major? Where do you work? /What do you do? How many brothers/sisters do you have? What is your favorite (music, team, color, hobby, TV show)? / Do you like ( a particular music group, sport, TV show)? My guess is that if we look at most modern language textbooks, we will not find these questions in the first few chapters. We may not find these critical question grouped together. For example, one textbook might not teach “to live” until the 4th chapter and the course only covers the first 5th chapters of the textbook. I think that we can learn a great deal about what is important to our modern language students by asking them what they would want to say about a common topic found in the textbook. Does the language textbook reflects things that are of importance to students? Or does the textbook focus on its own grammar and vocabulary without focusing on what students, their intended audience, would normally want to say about a topic? A communicative book focuses on what real people would ask/answer about a topic in a normal conversation. A grammar focused textbooks presents a very limited amount of questions but concentrates more on a specific grammar point that has been worked into the questions/conversation.